Readers of this blog need no introduction to British innovative sax player John Butcher. 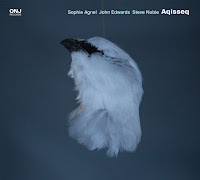 His four new releases offer engaging and intriguing sonic journeys with an enigmatic site specific, new and old collaborators, adventurous solo pieces and an orchestral work with Butcher as an improvising soloist. 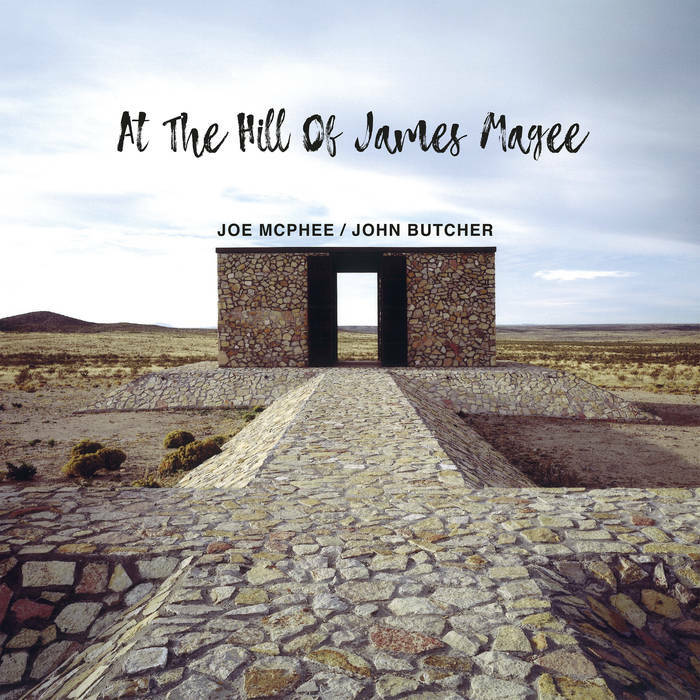 The first ever meeting of master sax players - American Joe McPhee and British John Butcher happened in April 17, 2010 in the middle of nowhere. McPhee and butcher played at The Hill, located 70 miles east of El Paso, Texas, deep in the the Chihuahuan desert, where enigmatic artist James Magee - a painter, sculptor, poet, ﬁlm and video maker, has been building, over the last three decades, four identical buildings connected by causeways, crafted of irregularly-cut shale rock, spreading over 2,000 acres of desert land. Magee's work on The Hill is supposed to conclude around 2030. Only a handful of people have visited The Hill and photographing it is strictly forbidden. McPhee and Butcher played at The Hill on a dry and windy afternoon, before about 70 people who did the tasking pilgrimage to the unique site. Their set transforms the intensity of The Hill into a profound, ceremonial-spiritual experience. 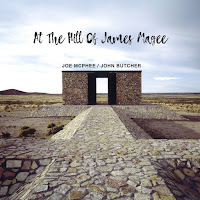 Any performance in this forces the musicians to play, actually collaborate, with the voices of the desolated landscape, the architecture and rare acoustics of The Hill, as well as in relation to its emotional weight and the unfathomable dedication of Magee to this place. The set began with the 20-minutes “Sometimes Yes, Sometimes”. McPhee plays the alto sax inside the North building and Butcher plays the tenor sax inside the South Building, each of these buildings is five meter high and full of sculptors and installations by Magee. The whole set was captured by two microphones, located outside the buildings and recording into battery-powered equipment, as The Hill is far from the local electric grid. At one point, McPhee and Butcher exit the buildings, continue playing as they walk to the opposite structure, passing each other at the center of the cruciform walkway. McPhee and Butcher alternated solo on the next shorter, five pieces, played on the walkway, elevated three meters above the ground. McPhee and Butcher opt for a reserved and sparse tone, as The Hill natural reverberations proved to be a powerful, open-air echo chamber to reckon with. Often both sound reverential and contemplative, stressing brief silences, but on few occasions they burst with emotional, fiery cries. 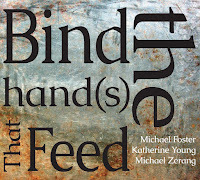 Both McPhee and Butcher responded subtly to each solo pieces but avoided explicit comments. Their short solo pieces emphasized McPhee’s hypnotic, emotional urgency and Butcher’s innovative. percussion ideas. They conclude this magnificent set with the serene and playful duet, “St. Ida's Breath (Less Her Neck And Teeth)”. AMM’s percussionist Eddie Prévost and Butcher shared the stage for the first time at Derek Bailey's 1990 London Company Week. They didn't perform together again until March 2005, when they recorded their first duo album, (Interworks, Matchless, 2005). 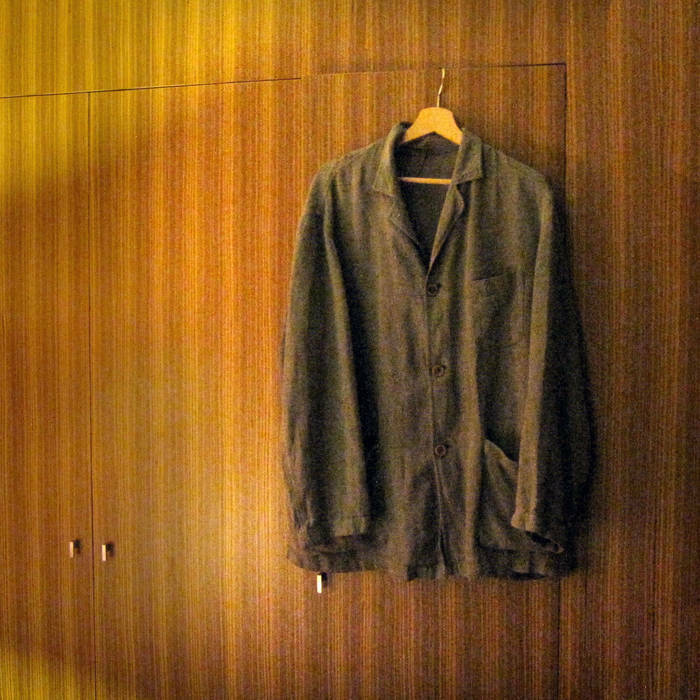 Since then they kept performing together in different formats, recorded collaborations of Butcher with AMM (Trinity and Sounding Music, with an expanded AMM featuring pianist Christian Wolff and cellist Ute Kanngiesser, Matchless, 2008 and 2010) and later Butcher took part in in Prévost’s series of Meetings with Remarkable Saxophonists (Volume 2, with double bass player Guillaume Viltard, Matchless, 2012). Visionary Fantasies was recorded in April 2018 at Iklectik, London. 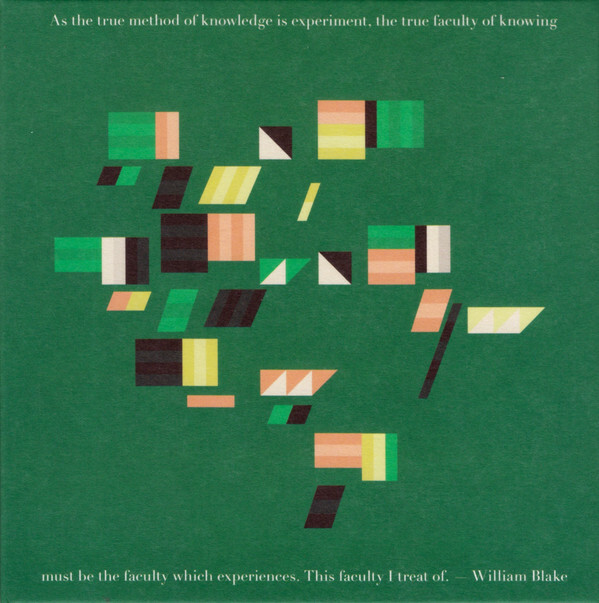 The cover frames this duo recording with a fitting aphorism by William Blake’ from “The Argument” (1788): “As the true method of knowledge is experiment, the true faculty of knowing must be the faculty which experiences. This faculty I treat of”. Butcher begins with two solo pieces, the contemplative “Twice and More” that investigates the resonant qualities of the tenor sax and as an abstract wind machine, and “Tree Demons”, where Butcher orchestrates bird calls into a playful, urgent choir. Prévost’s 19-minutes solo “Obsessional Enquiries” begins as a deep meditation on the microtonal and almost infinite resonant characteristics of cymbals and gongs. Later it morphs into powerful waves of intense, metallic sounds, each one explores more and more nuances of these sounds, and then it concludes with a quiet, graceful coda. 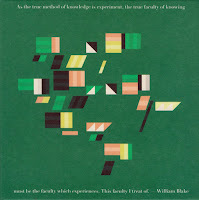 Prévost and Butcher three-parts “Visionary Fantasies” suite encompasses many facets of the inventive and imaginative language of these master improvisers. They play and experiment with abstract, constant-shifting dynamics as means to share ideas and doubts, feed each other’s with an invigorating energy, release the torturing tension, suggest a vivid, cinematic drama and offer compassion and tender yet sober comfort. And all performed with rich, beautiful colors and engaging elegance. Made to Measure is collection of six distinct compositions from Butcher, commissioned or written for specific situations, events and compilations, dating from 1998 until 2017, and available only on Butcher’s Bandcamp page . 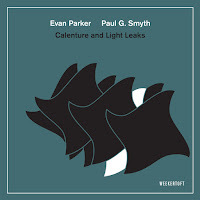 The opening, playful “and sometimes a mistake is the best move you can make”, for multi-tracked tenor and soprano saxophones, offers a clever architecture of sax choir. It was written as a response to a passage in Daniel Defoe's 1772 novel "A Journal of the Plague Year" , contributed to Argentinian author and scholar Reinaldo Laddaga's project things a mutant needs to know (Unsounds, 2013). “Asymptotic Freedom”, titled after a term from particle physics, for one player who uses saxophone controlled feedback, acoustic guitar, e-bow, snare drum and piano wire, responds to the “self destructive art" theories of artist and political activist Gustav Metzger, and commissioned by harpist Rhodri Davies. This abstract piece suggests an enigmatic rhythmic game made of the saxophone imaginative, feedback noises. 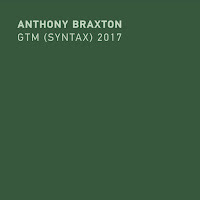 The brilliant, cinematic “Between the Skies”, for saxophone and sound files, appeared in a different version on Tarab Cuts (Out of the Machine, 2014). This piece flirts with pre-WWII Arabic music, and often abstracts the calls the muezzins recitations. It was commissioned for Visiting Tarab, conceived by Lebanese composer Tarek Atoui as a modern day response to the classical Arabic music in the private collection of Kamal Kassar in Beirut. Butcher edited and re-composed sound files from these old 78’s vinyls. The mysterious “Penny Wands & Native String”, for 8 futurist noise machines - Intonarumori - and saxophone, corresponds with Italian painter Luigi Russolo innovative ideas about sounds and noise, as captured in his manifesto “The Art of Noise” (1913). This piece was performed with a fragment from Russolo’s film “Risveglio di una città” (Awakening of a City, 1913). The Intonarumori were reconstructed by Russolo expert Luciano Chessa. The short and, again, brilliant “Monk Hum”, composed specially for the cassette-only label Tapeworm's centennial edition compilation, A Can of Worms (2017), is a game of touches of the saxophone keys with microphone hums that refers wisely with Thelonious Monk’s dissonant and angular lines. The last “Three Scenes for Five Tenors” is an improvisation from 1998, released before on a compilation disc with RESONANCE magazine. This piece offers another arresting architecture of saxophones choir, but more provocative one than the opening piece..
Butcher performs here on one (of three versions) of the orchestral work of British composer Christopher Fox, Topophony for orchestra - with or without Improvising soloists, commissioned by Israeli conductor and Tectonics festivals founder and curator Ilan Volkov. This work implies that improvisation can operate at the heart of the compositional process. This composition was premièred with Volkov conducting the BBC Scottish Symphony Orchestra with soloist Rhodri Davies, and later performed with the Athens State Orchestra with guitarist Fred Frith as soloist and in a chamber version with the Israel Contemporary Players with soloists clarinetist Yoni Silver and percussionist Ram Gabay. 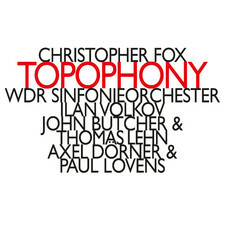 Here Volkov conducts the WDR Symphony Orchestra in a studio version of Topophony. The first version features soloists German trumpeter Axel Dörner and drummer Paul Lovens, the second version features the WDR Symphony Orchestra alone features soloists German analog synthesizer player Thomas Lehn and Butcher. Topophony is a serene and poetic soundscape, comprised of a series of thirty-nine interconnected soft harmonies, layered in the formation of a natural landscape of drifting sand dunes in the desert or slow moving clouds in the skies. The orchestra music is fully notated but the soloists have no instructions except that they should start playing after the orchestra’s music has begun and finish before it ends. The score also stipulates that the improvisers should listen to not more than one orchestral rehearsal and that they should not rehearse with their orchestral colleagues. The improvisers should be situated within the orchestra, but separated from each other. The conductor acts as a mediator between the orchestra and the soloists and has some degree of freedom, or at least choice: the score instructs him to vary his beat continuously and so he has the freedom to shape the length of each chord. Dörner and Lovens blend into the orchestra dynamics and within the meditative, pastoral orchestral sound, but often add subtle commentaries. Lehn and Butcher act alone most of the time, but both stress sonic contrasts, sometimes even sonic collisions. They charge the hypnotic dynamics and spontaneous bursts of urgent sax calls and overtones or alien, electric tones into the overall, acoustic, orchestral envelope, but both never disrupt the peaceful flow of this impressive work. This is a very nice roundup for a musician, maybe the most important saxophone voice for the past two decades, that still manages to surprises us. 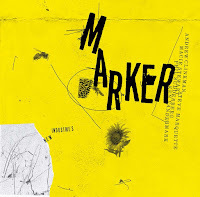 I also recommend Common Objects (John Butcher, Angharad Davies, Rhodri Davies, Lina Lapelyte, Lee Patterson, Pat Thomas) – Skullmarks (Meenna, 2018) released last November.